Spider-Man versus a famous member of his rogues’ gallery. We’ve seen it all before, right? Spider-Man: Into the Spider-Verse, though, is daring to be different. In a pair of exclusive images from our sister publication Total Film magazine, Peter Parker is fighting a behemoth version of a famous Spidey villain, plus he manages to team up with a couple of alternate universe versions of himself for good measure. A good thing, too – he’ll probably need all the help he can get. But, the kicker when it comes to Into the Spider-Verse is not bigger, badder versions of villains from Spider-Man’s past, but the fact we’ll be dealing with multiple Spider-Men, Spider-Women, and even a Spider-Ham. 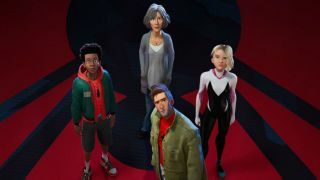 Spider-Gwen, Miles Morales, and a version of Peter Parker will have to team up to put a stop to the timey-wimey multiverse madness that is plaguing every version of Spider-Man you can conceivably think of. Maybe it’s Green Gobin’s hat. Yep, it’s definitely the hat. If you want to hear more about Spider-Man: Into the Spider-Verse, be sure to check out the latest issue of Total Film magazine, and subscribe to keep up with all of the latest news, previews, and features from the wonderful world of movies.